Imexpharm Pharmaceutical JSC (IMP), one of Vietnam’s four biggest pharmaceutical firms, is to open the Vinh Loc high-tech antibiotic plant at a cost of VND180 billion (US$7.83 million) by the years’ end, while inaugurating the VND370 billion (US$16.09 million) Binh Duong high-tech pharmaceutical plant in late 2019. “We plan to complete the portfolio of EU-GMP-standardised products to increase the contribution of ethical drugs to the total revenue, while locating partners to boost exports,” Nguyen Quoc Dinh, chairman of IMP’s board of directors, told VIR. “To ease over-the-counter (OTC) pressures, we aim to increase the contribution of ethical drugs to 40% by 2020, while decreasing that of OTC revenue to 50%, while reserving 10% for exports,” he added. IMP currently has three foreign shareholders: Balestrand Limited (6.09%), Franklin Templeton Investment Funds – Templeton Frontier Markets Fund (8.49%), and Kwe Beteiligungen AG (8.23%). However, not all leading Vietnamese drugmakers target the international market. Traphaco (TRA), the second-largest publicly-traded drugmaker in the country, is a typical example. 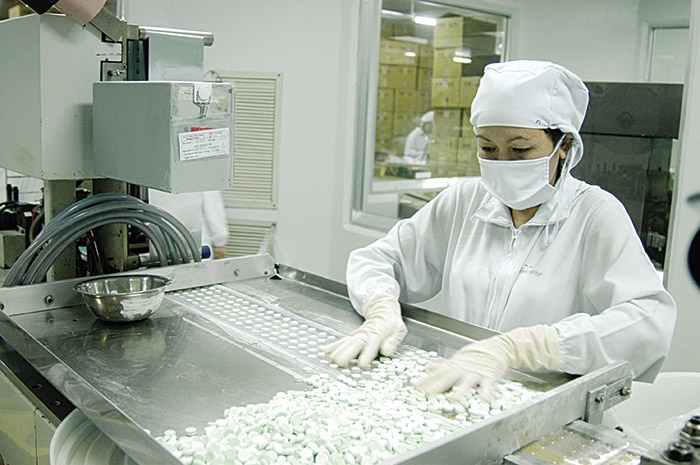 The firm aims to become the No.1 drug producer in Vietnam by 2020, with market capitalisation of VND10 trillion (US$434.8 million), revenue of VND4 trillion (US$173.9 million), and a distribution network of 40 branches nationwide. “We are co-operating with partners to boost the distribution of imported pharmaceuticals. We do not have plans to export now,” a representative from TRA told VIR. It is clear why TRA targets the domestic market rather than going international. Currently, the OTC market segment of TRA is on a growing path, while the ethical drugs segment is improving with new products meeting the PIC or GMP-EU standards of the new factory, thus enabling the firm to win bids. TRA has the State Capital Investment Corporation (35.67%), Magbi Fund Ltd. (24.99%), and Super Delta Pte. Ltd. (15.12%) as their biggest shareholders. According to industry insiders, the drugmakers which scrap foreign ownership limits (FOLs) have a higher tendency to go international than others. Moves by the biggest publicly-traded drugmaker Hau Giang Pharmaceutical JSC (DHG), and the third-biggest Domesco (DMC) seem to confirm the fact. DHG, with a 32% stake owned by Taisho Pharmaceutical Holdings, one of the largest pharmaceutical firms in Japan, is now attempting to upgrade its lines to boost exports, thus enabling it to reach an export revenue of US$5 million by 2020. DHG has completed the upgrading of effervescent line Hapacol with the support of Taisho. As expected, the line will be granted with PIC/S standards in Malaysia in December, thus enabling DHG to export Hapacol to the market. The firm also plans to upgrade production lines of strategic products to Japanese PMDA standards and EU PIC/S standards. DHG drugs are now available in 13 countries, namely Moldova, Ukraine, Myanmar, Russia, Mongolia, Cambodia, Nigeria, Laos, Singapore, Jordan, Sri Lanka, Romania, and the Democratic People's Republic of Korea. Export channels can partly add money to DHG’s revenues at least in the short-term, when the scrapping of the FOL creates a negative impact on business performance. The FOL removal forces the drugmaker to give up some business lines, including sale of goods manufactured by other units, and a packing business. As shown in the third-quarter financial statement, DHG’s consolidated net profit is down 9.9% on-year, while consolidated net revenues fell by 1.49% between January and September, partly because of the suspension of sales of MSD and Eugica products in line with the FOL removal. In similar moves, DMC is expanding to venture further into international markets. Now, export is a part of its revenues. In the third quarter of this year, export revenue was VND2.35 billion (US$102,170), thus raising the total figure in the first three quarters to VND5.2 billion (US$226,100), and contributing to revenue improvement. Currently DMC, which has Abbott Laboratories, one of the world’s leading nutrition groups, as the biggest foreign shareholder (51.7%), exports to 12 markets including Japan, South Korea, the Philippines, and Hong Kong. Recovery trend TRA, DMC, and IMP have announced their three-quarter financial statements with positive results after posting poor performances over the first half. TRA saw revenues rise by 10% on-year during the period. In the first half of this year, the drug-maker recorded an on-year fall of 7 and 48.6% in net revenue and net profit of VND798 billion (US$34.70 million) and VND56 billion (US$2.44 million), respectively. “This period marks the second year of our new factory operation, with business indexes meeting yearly targets and many new products with high prospects. This is a highlight of our nine-month business,” said the TRA representative. At present, TRA has become the nation’s second-biggest provider in the OTC channel, just behind Sanofi. Meanwhile, in the first nine months of this year, IMP recorded an on-year rise of 21.35% in its net profit in the third quarter, thus contributing to raising the firm’s net revenue and net profit by 7.9 and 11.65% to VND810.15 billion (US$35.22 million) and VND99.28 billion (US$4.3 million) in the first three quarters. IMP attributed the improvement to the market expansion and a rise in sales of IMP-made products. In the same context, DMC fetched a net profit and revenue of VND162.91 billion (US$7.08 million) and VND973.78 billion (US$42.34 million), up 3.1 and 2.7%, respectively. Looking back the second quarter of 2018, TRA, MDC, and IMP all reported a fall in profit margin due to cost burdens. Accordingly, TRA fell from 57.8% in the second quarter of last year to 51.1% in the same period of 2018, while the ratios for DMC and IMP were 41.1% versus 36.4 and 44% against 42.2%.